Click to make sure you always embrace all the opportunities to get a little extra savings back in your pocket. Sign up for the newsletter and receive notifications on sales, promo codes and other offers at Smyths Toys Online! No need to worry about those extra costs because Smyths are offering free delivery on orders over £25! Smyths has a fantastic selection of pushchairs and strollers with top brands such as Babylo, Silver Cross and more! WIth up to 25% off Imaginext, Smyths is the perfect place to treat your little angel. Up To 75% Off LEGO Orders At Smyths - Including Batman, NINJAGO, NEXO KNIGHTS & More! Treat your little one to some new LEGO, and save 75% on your order today. Make your next shopping trip that bit more convenient, and enjoy free click and collect at Smyths. At Smyths, you can find an incredible 30% off selected board games, fun for all the family! Smyths Toys has special deals for you on Nintendo Labo Variety and Robot Kits! Applies to home delivery or in-store collection. Console And Bundle Deals Now! Smyths Toys announces super savings on console & bundle deals now! Save £6 When You Spend £15 Today! Race to Smyths Toys for can't miss deals with this voucher now! This discount code expired on 30/05/2018 BST. Smyths Toys has a great selection for you to choose from. Right now, get £5 Off When You Spend £20 On Selected Brands! Offer ends soon! This discount code expired on 23/05/2018 BST. Smyths Toys has got you covered this Christmas. Right now, enjoy Free Delivery Over £20! Order today! This discount code expired on 01/05/2018 BST. Save £10 On Nintendo Entertainment System Mini - Back In Time Deal! Get £10 off now and provide lots of fun and perfect family time! Show your kids how games used to look like. The console comes with 21 pre-installed games too! Get set for fantastic prices on LEGO sets. Click this coupon and save 20% off RRP. This discount code expired on 05/04/2018 BST. Hurry - grab the biggest titles and top selling gaming accessories at discounted prices at Smyths Toys. Make sure you save as much as you can on Easter gifts! This discount code expired on 04/04/2018 BST. Smyths Toys has the goods. Right now, save on New Lego Sets! Offer ends soon! This discount code expired on 02/04/2018 BST. Super savings on Lego Ninjago movie sets with this coupon from Smyths Toys now! This discount code expired on 01/04/2018 BST. Smyths toy store is the largest toy store in the UK. If you are looking for it there is every chance that Smyths has it. The superstore chain stock everything from bikes, toys, games consoles, baby toys, action figures and even drones. Smyths have so much on offer it and is committed to encouraging learning and creativity development in children. 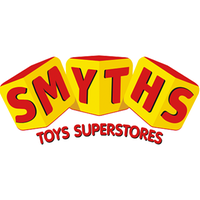 Smyths toy store is for children (and adults) of all ages stocking all the latest toys and action figures from the biggest movie franchises and television shows. It was founded in 1985 and prides itself on having all the best and newest brands in store and online. Smyths also stock everything an enthusiast needs to get started. Smyths online store has loads of wonderful thing to offer including their own discount codes that are available to use both online and in store. Smyths has some unique feature as well for all those people out there who need to buy a birthday or Christmas gift but don't know where to start. The Smyths “Gift Finder” will help you find the perfect gift for children and even adults. First off enter your budget into the “Gift Finder” followed by the age of the child and whether it’s a boy or a girl you are buying for. The “Gift Finder” will do the rest and find you all the gifts that are available online. You can then refine your selection further buy choosing from brands and categories. The “Gift Finder” makes it easy to buy the perfect gift for every child. The Smyths website also offers a “Click and Collect” function on their website. If you find something online you can choose to “Click and Collect” it. Smyths aims to email you within the hour when your order is ready for collection. All you need to do is take you mobile phone in with the Ready for Collection email to pick up your item. Smyths will even hold your order for two days until you are ready to collect and if you can’t make it in the will put it back on the shelf. No charge. No problems. Smyths also offer free delivery for orders over £20 and if you are in hurry to get your item Smyths offer Next Day Delivery on orders that are placed before 5pm. For orders to mainland UK it costs you only £3.99 for an item over £20. For orders between £10 to £20 its £6.99 and for anything under £10 it costs £8.99. If you are one of those people who leave your purchases to the last minute then Smyths toy store have really got you covered. Smyths love in-store events. You can find out some of the cool things for kids on their website. Smyths holds regular events at all their 100+ UK stores; everything from Thomas and Friends to Champions League parties. They even hold Pokémon Card Trading Game days and Birthday parties for each individual store opening day anniversary. Many of these events are free of charge but it’s always a clever idea to check ahead just in case. What Smyths discount codes does Groupon have? At Groupon, we take pride in the fact that we constantly receive the latest and most-up-to date promotions and deals, and what with updating our site daily, our offers are also changing frequently so it’s a clever idea to check the website regularly or sign up for updates. We will always have money-off offers to help you to get the best deals, as well as other promotions that will help you to make the most of your purchases at Smyths. Some off our vouchers include deals on Toys, Pushchairs and Carrycots, Baby Toys and Gifts and much, much more. If you have a keen eye for a bargain, then you will want to keep an eye on our Smyths Groupon page to make sure that you don’t miss out on a great offer that will be perfect for you. How do I use my preferred Smyths discount code? Using a Groupon discount code is simple. All you need to do is have a look through the codes that we update regularly and choose one that suits you. Give the voucher a click and we will automatically load and activate the deal for you. Once everything has loaded all you need to do is click the “Shop Now” button which will forward you straight over to the Smyths website. Once you are there it’s only a matter of choosing your perfect pair of jeans or you favourite hoodie and adding them into your basket. Once you have decided on what you would like to buy head on over to the checkout to pay and your Groupon discount code will be loaded up and sitting waiting for you. It is as easy as that! How long do vouchers stay on the Groupon website? Here at Groupon we pride ourselves on how up to date our vouchers are. We have great deals on everything including Smyths Toy Store every day. We always recommend you use our coupon as soon as possible to get the best deal available. Some of the offers that are available are more time sensitive than others and chances are they may only be available for a day or two so you may want to jump on these ones as soon as possible so you can always grab yourself a bargain. Some of the deals may last longer. When one of our deals is closing in on its expiration date, we will inform you the exact date and time the coupon will run out. If you want to see some of the deals you may have missed just scroll down to our “Expired Coupons” section where you can find a list of deals that have run out. From time to time due to popularity these deals might be extended so it’s always worth your while checking to see if the site is still accepting the deal. If you are lucky enough to find a code that is still available then use it immediately before it disappears. As always, we’re here to make your online shopping that bit easier, with lots of useful information alongside all the usual deals and discounts. Make sure to take a look at this list of some of the more common frequently asked questions about Smyths Toys. How do I check if a product is available? Before you head into one of Smyths Toys’ shops you can check to see if the item you’re after is available online with a handy tool on their website. You can do the same when you’re looking for an item to order for delivery, by using the online Home Delivery tool to check availability. The time taken for your item to be delivered will depend on the delivery option that you selected when completing your order. If you choose Express Shipping before 5pm then you’ll receive the order on the next working day. Standard Shipping will take about 2 to 4 days. If you spend over £25 then you can enjoy free shipping on your order when you select the Standard Shipping. Pretty nifty huh? When you choose click and collect for your order, your item should be ready for collection about an hour after you place the order. Your items will be held for 2 days, giving you plenty of time to come and collect them. What payment methods do Smyths Toys accept online? Unfortunately, you will not be able to pay with any other methods. Make sure to check Smyths Toys own help page about payment options for more details. Say goodbye to the days of waiting around, not knowing where your delivery is or when it will arrive. When you make an order with Smyths Toys you will receive an e-mail that includes a tracking link, so that you can see exactly where your purchase is. If you decide that you no longer want an item you can return it to Smyths Toys for a refund, as long as it is undamaged and unopened in its original packaging. You can return items in any Smyths Toys store or by returning them through the post. Do Smyths Toys have a student discount? Smyths Toys don’t currently offer a student discount, but they regularly have lots of new discounts and ways to save. We keep this page up to date with all the latest vouchers and promotional codes for Smyths Toys, so make sure to come back regularly to see what is on offer. How do I contact Smyths Toys? To speak with Smyths Toys directly you can contact them through a number of different sources.